This is another one that its good they don't charge by weight, as it would make a good door stop. Or super paperweight when not used for it's purpose. It is the desk reference companion to the previous pocket version. 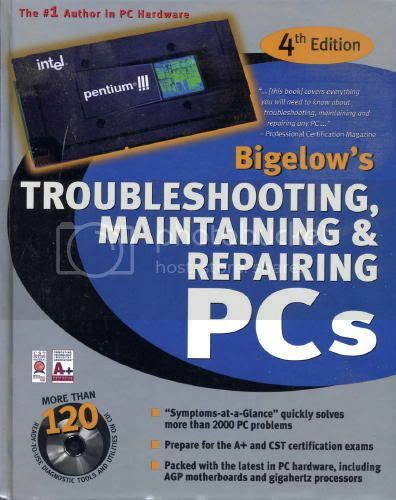 It has 41 chapters, on everything that is connected to a PC computer. Starting with desktops and towers, monitors, boot, opersating systems along with the preservice checkout. Batteries,Bios,busses,CDRom chiopsets,CMOS, Data recovery Techniques,Error codes,Floppy drives, fans and cooling,Hard drives,joysticks,memory, mice and trackballs modems and monitors,Motherboards,ports,plug and play, Power protection,power supply,SCSI system, sound cards. The disk has about 19 items on it with the instructions in the book on how to use it.